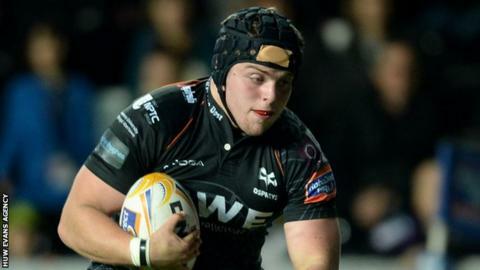 Ospreys have handed 20-year-old loose-head prop Nicky Smith a three-year deal. Smith earns the contract after impressing in eight regional appearances this season. He has been included in Wales' Under-20 squad for the Junior World Championships in New Zealand in June. "I never dreamed in a million years when I was growing up that I'd ever sign a professional contract to play rugby for the Ospreys," said Smith. "To actually achieve it, I'm over the moon. "This is just the beginning for me though, I'm nowhere near the finished product and I'm going to need to show a lot of patience, put in plenty of hard work, and it's going to take time. "There is big competition and some big names in the Ospreys tight five so I've just got to be patient, bide my time, keep learning and take any chances that I get." Smith's senior regional debut came in January 2013 at the Brewery Field, against Sale Sharks in the LV= Cup. He is a product of the Ospreys development programme, and has been a regular in the Principality Premiership for Swansea over the last two seasons, making 31 appearances. He was part of the Wales squad which reached the final of the Junior World Championship in France in 2013. Ospreys rugby operations manager Andy Lloyd believes Smith has real potential. "Although he only just turned 20 this month he is a mature young man," said Lloyd. "He's a fine physical specimen, a great scrummager and a dynamic ball carrier, and he can also be a destructive defender. "With all that in mind we genuinely believe that we have a potentially outstanding loose head prop on our hands." Smith has become the ninth player to have signed a new contract since the start of the year, following on from Alun Wyn Jones, Sam Lewis, Ashley Beck, Eli Walker, Jonathan Spratt, Ben John, Ryan Bevington and Dmitri Arhip. In addition, Rynier Bernardo, Josh Matavesi, Sam Parry and Dan Evans have been recruited by the region.